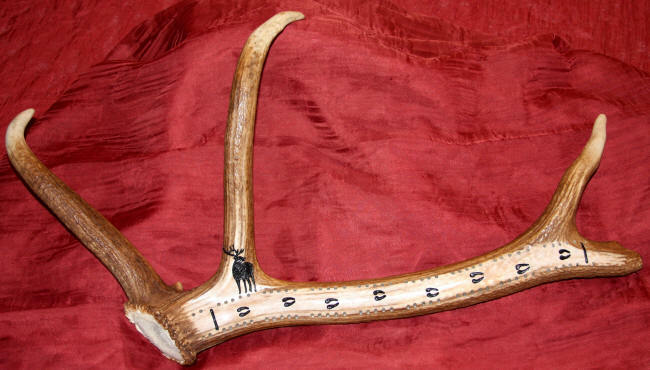 Scrimshaw antler cribbage board made from moose, elk, deer, and caribou antler. The following images are just an example of our cribbage boards. Due to the volume of custom orders we are receiving we don't have many boards in stock; however we encourage your custom cribbage board order. If you don't see what you're looking for, please send us an email or call us with your ideas. Most requests can be done within two weeks at this time. 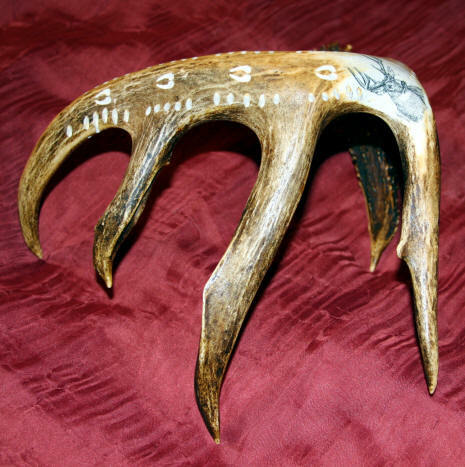 Our antler cribbage boards are created on moose, deer, elk, and caribou antler. Our boards vary in size so the number of holes for cribbage will vary. We design our boards so in a game you will play all 120 holes, however do to size and shape variations of some antlers some boards have 60 holes or 40 holes, which requires the players to play up, back, and occasionally back up. All antler cribbage boards come with pegs (square nails) which are concealed in an end of the antler. Scrimshaw of bull moose fighting on moose antler cribbage board.. Custom made for a customer's anniversary. Custom colored buffalo scrimshaw on caribou antler cribbage board with buffalo tracks. 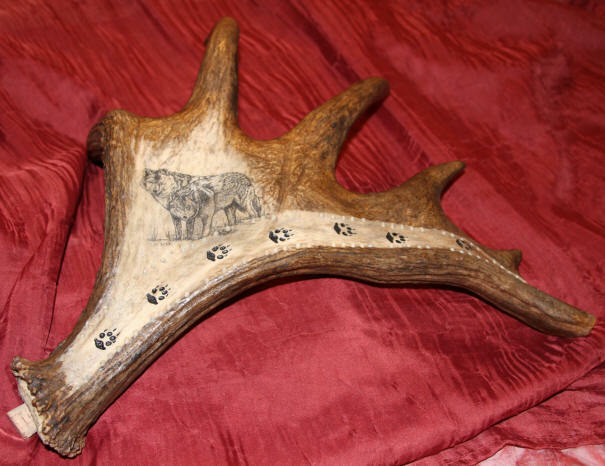 Scrimshaw of grizzly bear on caribou antler with relief carved bear tracks along board. 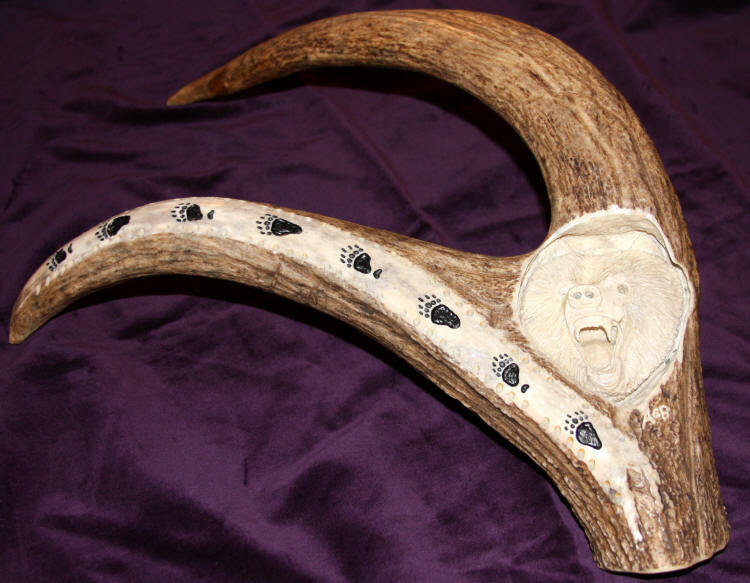 Scrimshaw of polar bear on caribou antler bez. Artistic bear tracks run along the board. 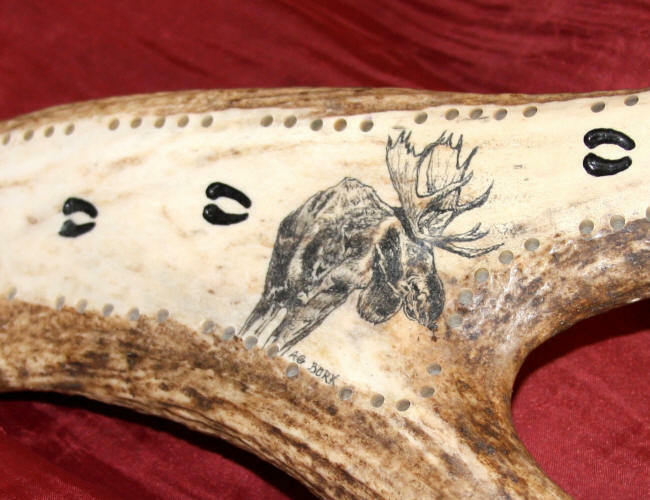 Scrimshaw of bull moose bedded down on caribou antler cribbage board. Caribou tracks run along the board. 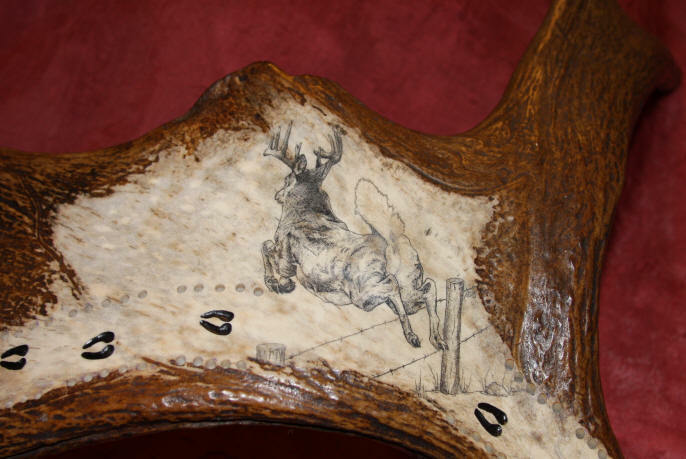 Scrimshaw of a bull elk bugling on elk antler base with tracks. 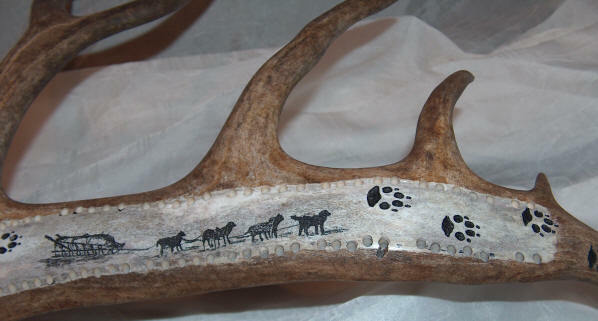 Scrimshaw of a dall sheep on moose antler base with tracks. 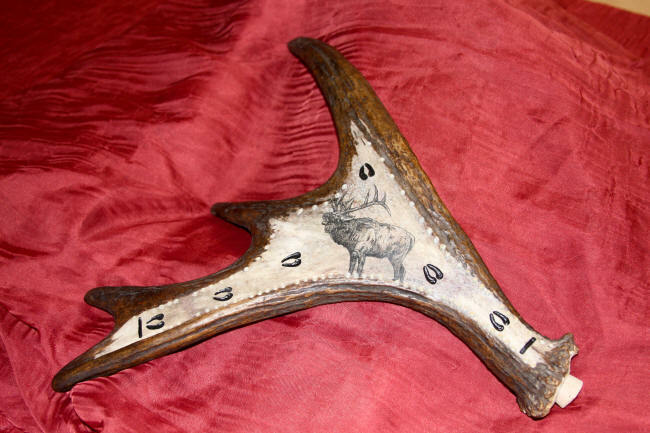 Scrimshaw of a bull moose on a piece of caribou antler with tracks. 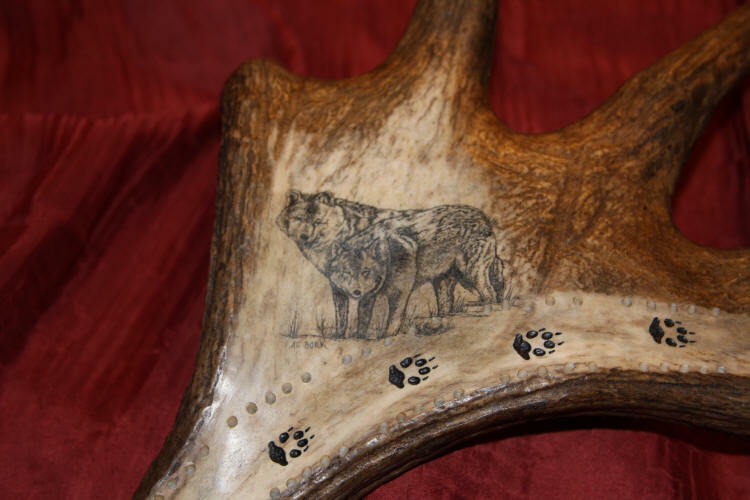 Scrimshaw of Alaska Malamute on caribou antler cribbage board. 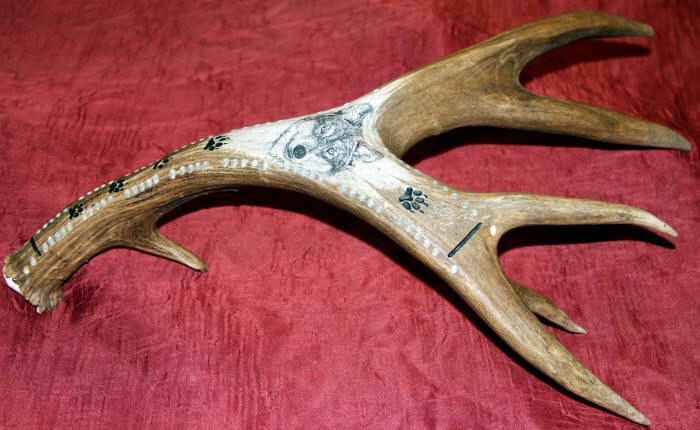 Scrimshaw of a whitetail buck on a shed whitetail antler with bladed tines. Tracks run along antler cribbage board. 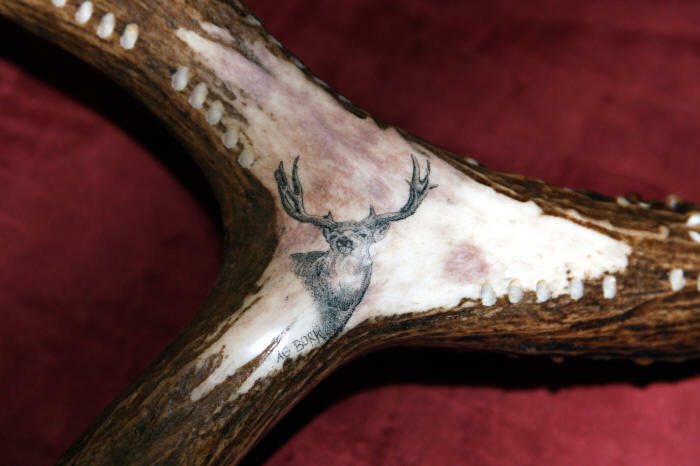 Scrimshaw of bugling bull elk on elk antler piece with tracks. 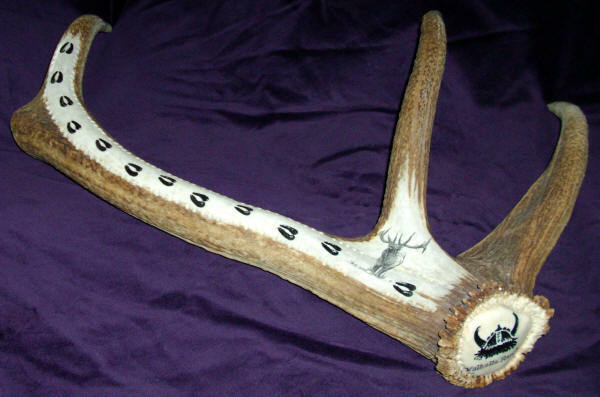 Scrimshaw of bull moose on naturally shed moose antler with tracks along cribbage board. Custom elk scrimshaw cribbage board on elk antler for Valhalla Ranch. 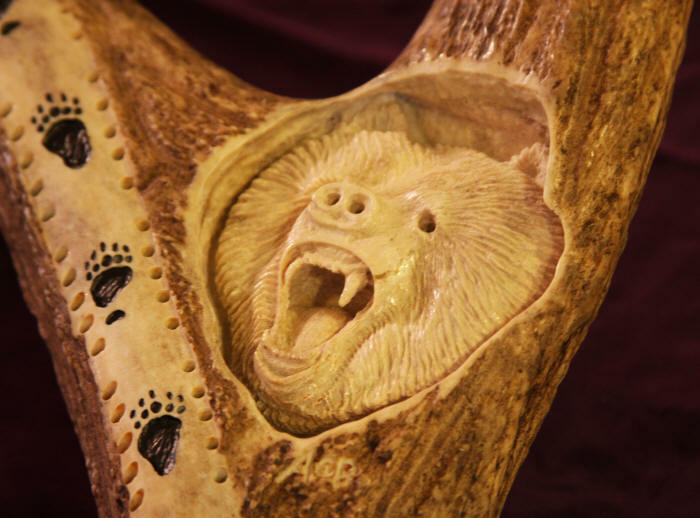 Bear carving in moose antler brow tine cribbage board with bear tracks along board. Color scrimshaw of two spawning red salmon on moose antler paddle cribbage board with bear tracks. 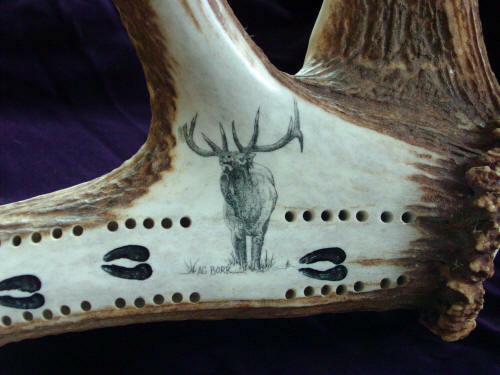 Silhouette of bull elk on elk antler cribbage board with tracks. 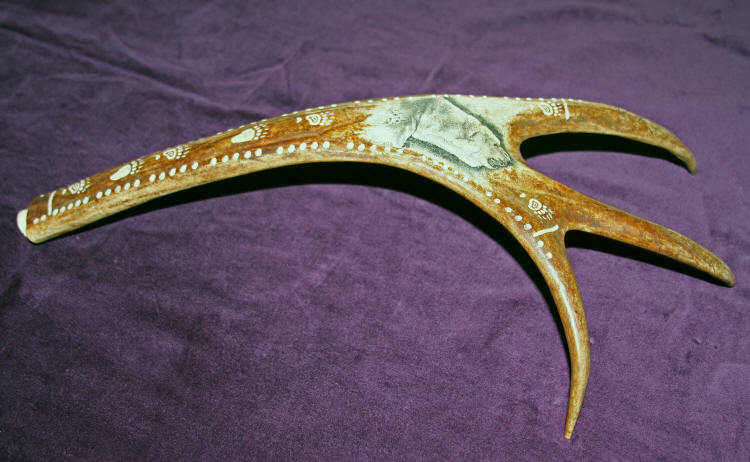 Scrimshaw of mule deer buck on shed mule deer antler cribbage board with deer tracks carved along board. 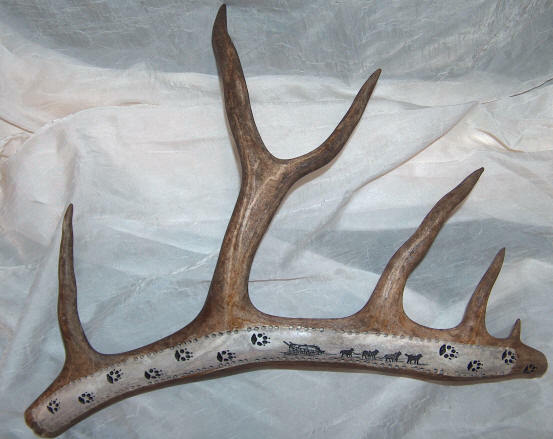 Scrimshaw of whitetail deer buck on whitetail antler cribbage board, with tracks. 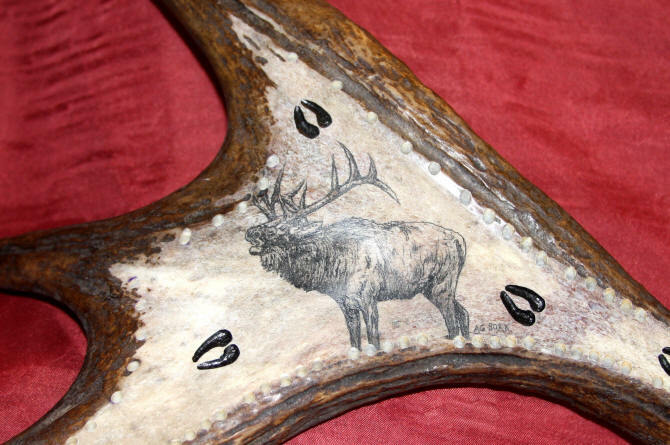 Scrimshaw of bull moose on moose antler brow tine with moose tracks along board. 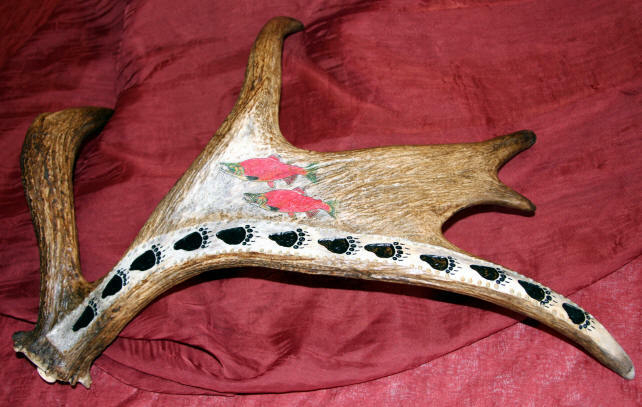 Scrimshaw of whitetail deer buck jumping over barb wire fence on moose antler paddle, with deer tracks along board. 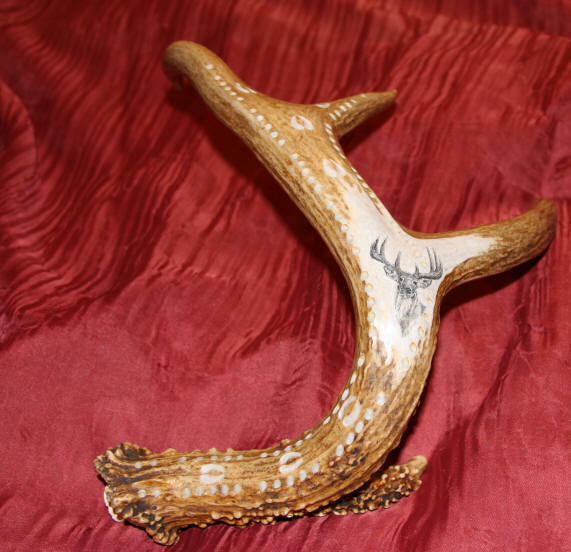 Wolf scrimshaw on mule deer antler shed. Wolf tracks run along cribbage board. 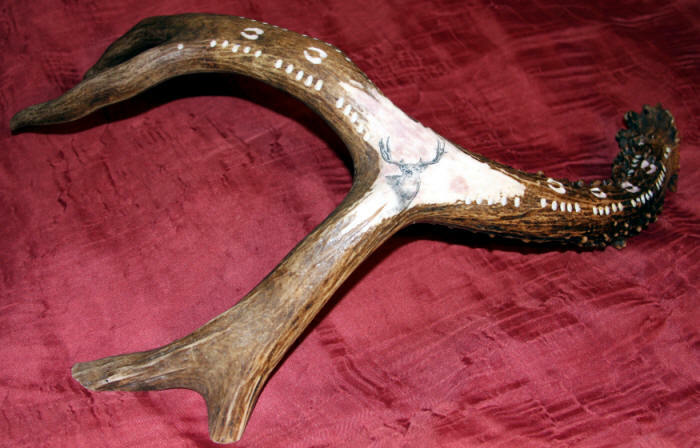 Bull caribou scrimshaw on the shovel of a cow caribou antler shed. Tracks run along cribbage board. Bugling bull elk scrimshaw on small moose antler cribbage board with elk tracks. 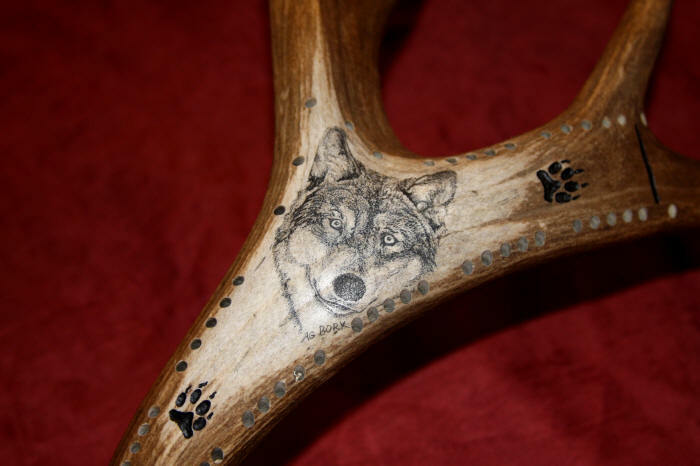 Scrimshaw of two wolves on moose antler paddle cribbage board, with wolf tracks along board. 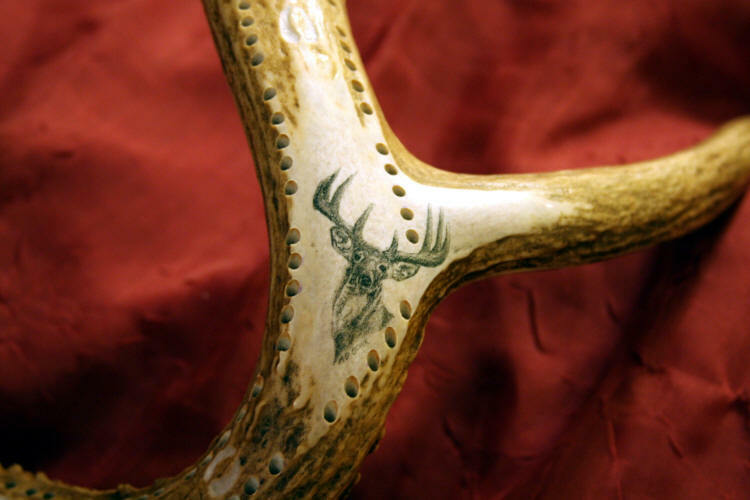 Scrimshaw of an owl on a caribou antler cribbage board. 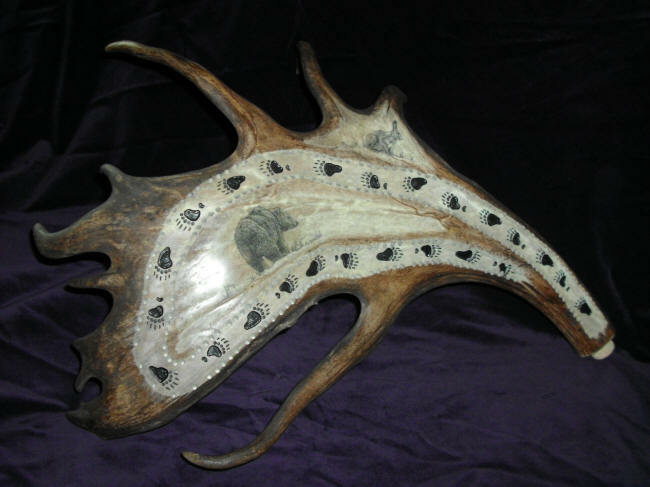 Cribbage board with scrimshaw of two bull moose on caribou antler with moose tracks. 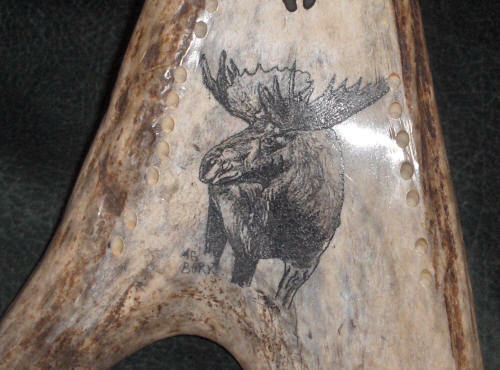 Scrimshaw of a bull moose on a moose antler cribbage board with moose tracks down the board. 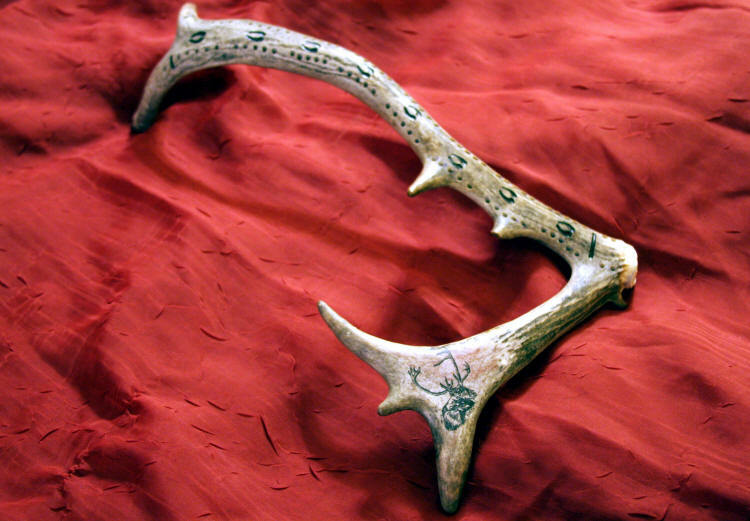 Caribou antler top with scrimshaw of shed mule deer shed antler with image of deer in background. Deer tracks along cribbage board. 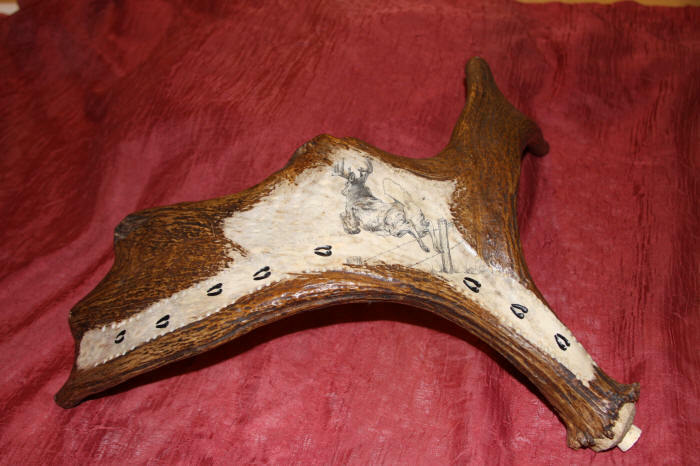 Caribou antler top with scrimshaw of dog team with sled with dog tracks down board. 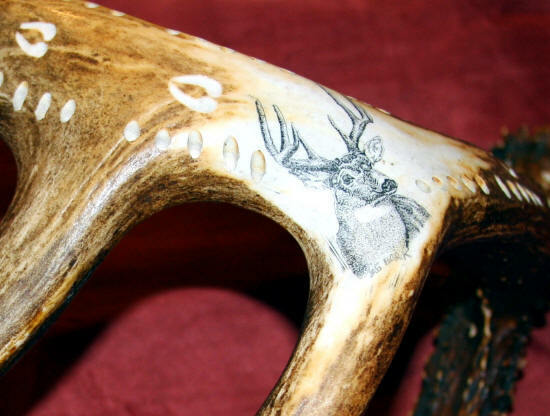 Scrimshaw of a whitetail buck a friend of ours recently shot during hunting season in Minnesota on a moose antler cribbage board. Cribbage board with scrimshaw of brown bear on caribou antler with bear tracks. 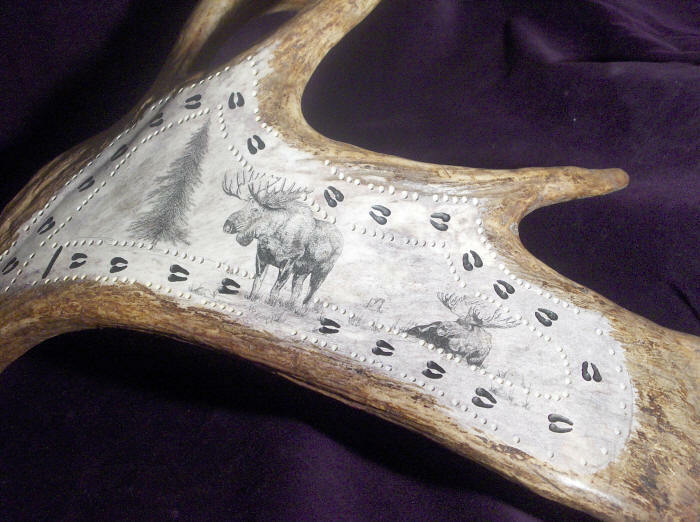 Scrimshaw of a bull moose on a moose antler cribbage board, with moose tracks along the board. 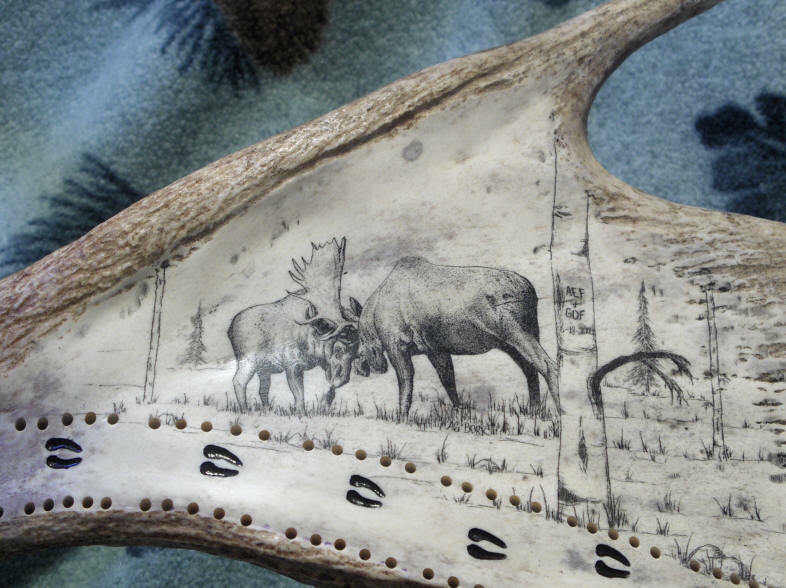 Scrimshaw of moose on a naturally shed moose antler cribbage board. Custom made for Moose Mountain Tours. 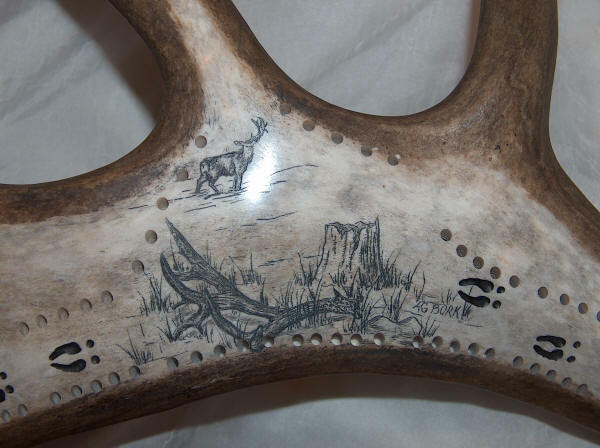 Scrimshaw of a bull moose bedded down on a moose antler with moose tracks down the cribbage board. Cribbage board with scrimshaw of grizzly along river on caribou antler with bear tracks. 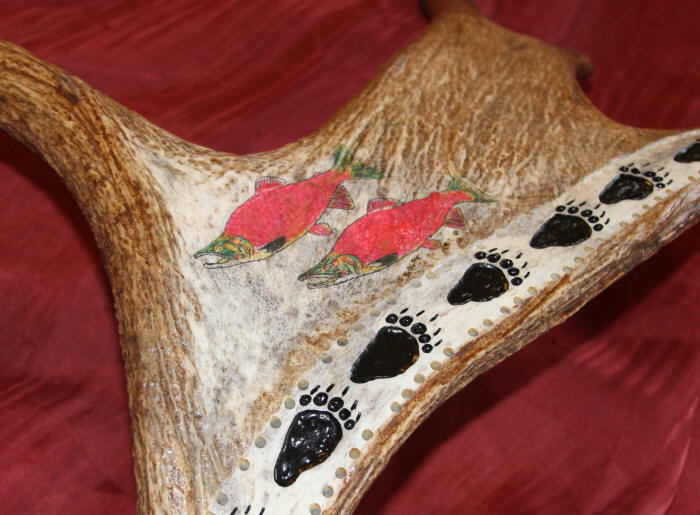 Cribbage board with scrimshaw of moose and bear on caribou antler with moose tracks. Cribbage board with scrimshaw of caribou and bear on caribou antler with caribou tracks. Cribbage board with scrimshaw of bull caribou on caribou antler top with caribou tracks. 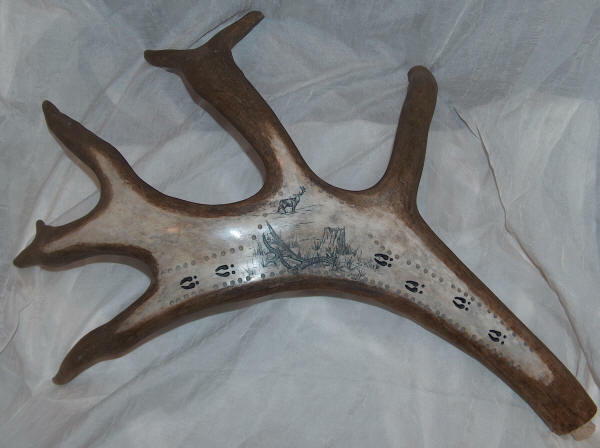 Cribbage board with scrimshaw of caribou on caribou antler with caribou tracks. Cribbage board with scrimshaw of caribou on caribou antler with caribou tracks and lodge sign. Cribbage board with scrimshaw of two bear on caribou antler with bear tracks. Custom scrimshaw of bedded down moose with "lazy moose" sign on a small moose paddle. Cribbage board has moose tracks. 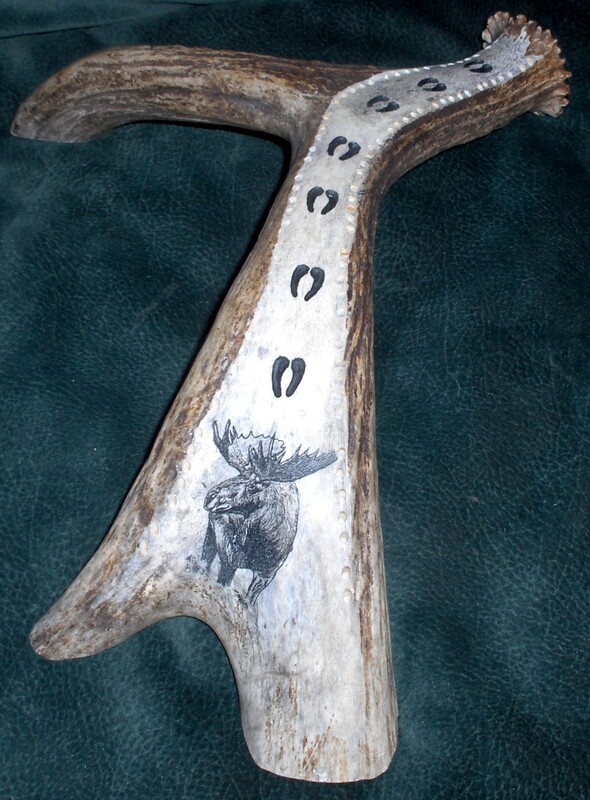 Custom scrimshaw of two bull moose on a moose paddle with tracks running along the cribbage board.